Britain has a superb craft heritage which is undergoing a significant renaissance and opening up to an entirely new generation of artisans and consumers alike. Tired of buying high-street items, an increasing number of people are seeking out the unique quality attractions of hand-made accessories, beautiful traditional textiles, vintage clothes and other superb crafts. Here we specialise in creating woven labels for handmade items and all labels are UK design to reflect the distinctive features of British craftsmanship & couture. Many of the UK’s original crafting specialisms – from tartan weaving through to millinery, jewellery-making, crochet, embroidery and dress-making – are experiencing a revival in their fortunes as demand for original pieces continues to grow. A fresh generation of artisans are bringing fresh spins and modern interpretations to traditional arts, making them highly desirable and relevant to a new generation of craft lovers. Of course, artisan crafts of the highest quality need to be identified as the work of each unique maker. 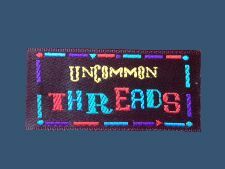 We produce extremely high quality and custom woven labels and cotton labels for handmade items of all kinds. 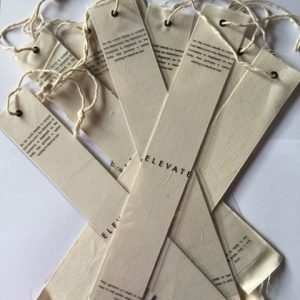 These include jute woven labels for hats, leather stamped custom labels for handbags and leatherwork, cut-out and designed cotton labels for handmade clothing, swing labels for crafts and small embroidered labels for beanies and cushions. Regardless of the type of craft, we have the perfect label to suit. Die-cut, designed, monochrome, colour, matt, treated, raw-edged or finished – we can produce whatever is required to uphold the craft brand and its design credentials. As well as the best quality woven labels on the market, we offer superb customer service, attention to detail and excellent prices that we believe can’t be beaten elsewhere for products of the same quality. We provide the best quality woven labels for handmade items, low minimum, free UK delivery.